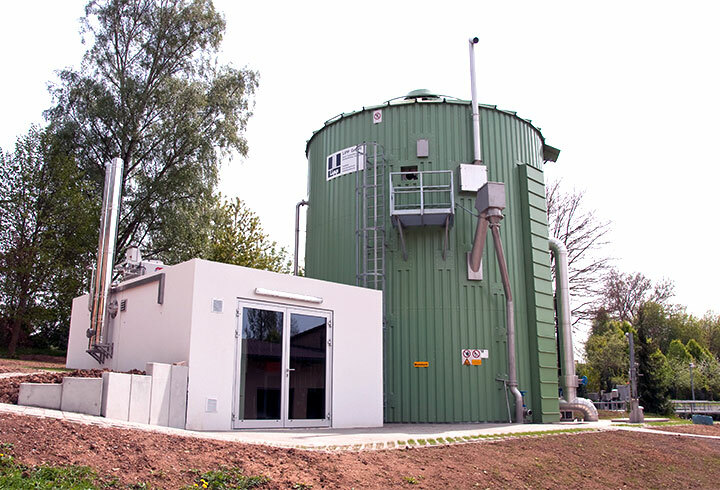 In addition to tank construction, LIPP built the first biogas plant in Germany in the 70’s. Furthermore, LIPP was one of the first companies to develop and sell small biogas plants in the early 80’s. By steady advancements in production technology and the materials used, as well as extensive experience in process engineering LIPP has installed in collaboration with its partners, hundreds of biogas plants in Germany and worldwide. The majority of these projects are still in operation and ensure proof of the high quality and the technical and economic performance of Lipp’s system solutions. To download the data sheet, click here. Lipp systems are modular and can be extended, modified or integrated into existing systems WITH EASE. 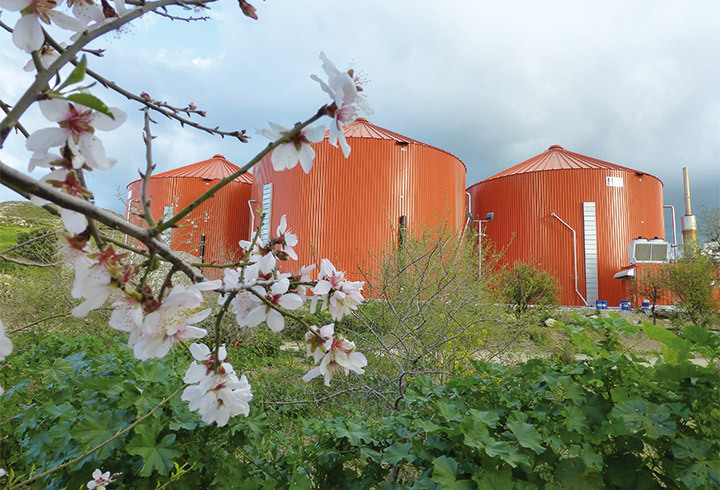 Biogas plants from Lipp are based on the so-called, wet fermentation. Through a 2-stage process, i.e., via regulation by an upstream hydrolysis stage or other substrate pre-treatment, input materials are prepared so that the anaerobic process can run optimally in the digester. Since it is the most flexible and the biological processes are best kept controllable Lipp favours the SBR process. This is also particularly suitable for anaerobic wastewater treatment, sludge digestion and is also used in agricultural biogas deposits. This means first that Lipp biogas plants are substrate flexible and allow an intensive use of the available digester area. Secondly, that with low self-sustaining energy requirements, a high degradation rate is achieved. It is interesting to note that Lipp’s digester can be operated not just in the SBR process (Sequence Batch Reactor). By making small adjustments they can also be operated as CSTR (Continuous Stirred Reactor), UASB (Upflow Anaerobic Sludge Bed) or MBBRs (Moving Bed Biological Reactor) and can therefore be used for a variety of applications. In addition to the corrosion-resistant and economical material Verinox, and the high quality materials and components, the double-fold is the guarantee for durable construction. The choice of optimal container geometry also plays a crucial role in terms of stirring ability, heat transfer and energy requirements, and therefore also to the profitable operation of the system. Specially developed roof structures, pumping and mixing systems, and special safety features complete the Lipp system. Some system components such as special agitators or gas storage facilities are purchased from long-time suppliers who are the recognized market leaders in their field. Many years of experience with various substrates and applications as well as cooperation with the appropriate suppliers for peripheral technology are other success factors in a completed Lipp system. Depending on customer requirements and geographic location, an individual scope of supply may be agreed between Lipp and its customers. Through this agreement, the customer benefits from the expertise, experience and a strong partner network of Lipp and can at the same time reduce overall costs of the installation by locating particular on-site service suppliers. From process engineering planning to design and installation of the main components, and start up through to analytical consulting, during operation Lipp provides support and its long term business experience to customers from the outset, and if desired, also long after project completion. Depending on the substrate requirements, Lipp recommends the container material and process engineering individually in order to ensure a stable process and the longevity of container systems and other system components. In this case Lipp may recommend minimizing a particular substrate mix or the use of special additives to prevent the excessive formation of aggressive substances, where possible, being considered in the planning phase. Furthermore, the stainless steel used in the container material VERINOX, depending on the application, can be produced with high-quality stainless steels such as 1.4571 (316 Ti) or 1.4539. In addition to the chemical and mechanical resistance Lipp’s cold rolled stainless steels guarantees high qualities for the container material used in VERINOX. Even with stirrers, nozzles and gas storage, higher grades are preferably used and as such a higher plant uptime is ensured. As well as the process technology features, the high quality of Lipp systems is based on the high-quality materials and the high-quality production. Fermenters, vessels, components and installation parts are developed by qualified staff, manufactured and coordinated at the factory. Only by using an appropriate surface treatment (pickling, passivation, galvanizing etc. ), as well as the solid precision fitted installation by qualified and experienced technicians on site, is the highest level of tightness and durability guaranteed. The automatic on-site production ensures a consistent, high quality standard, whether in Europe, America, Africa, Asia and Australia; taking into account earthquake areas, as well as the required wind and snow loads. From simple sludge storage tanks and other sewage containers for municipal wastewater treatment plants, to complete Sludge digestions system with the core component KomBio reactor, Lipp offers its customers complete system solutions for sludge digestion in municipal sewage plants. Lipp also has the design, planning and installation of agricultural biogas plants successfully implemented one of the first companies Germany in addition to pure fermenter. 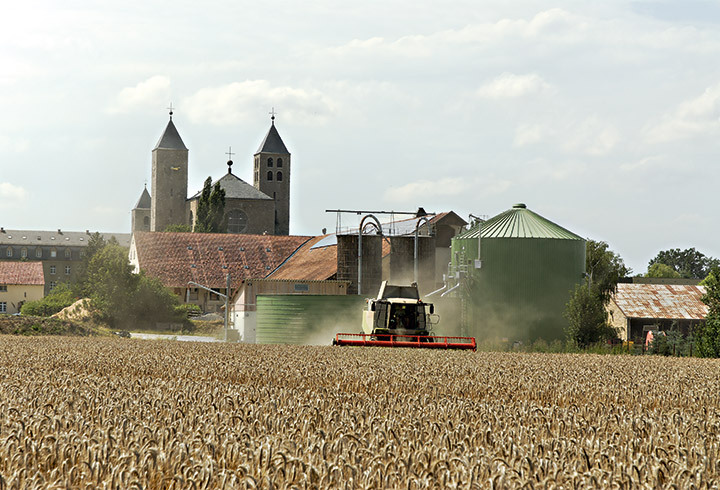 Hundreds agricultural plants in Germany and abroad prove the high competence in the process design and the high quality of the system components.